Gr. liguāmen (the generic name as the fish liquefy), Eng. 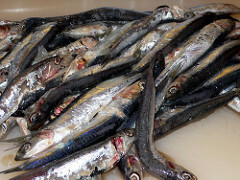 liquamen, a type of garum, sauce produced by fermentation of whole, small fish like mullets sprats and anchovies. As the Romans had no equivalent for the word “garum” they called it “liquamen.” This was the cheapest “garum” and was accessible to commoners. 1. The so-called liquamen is made in this manner: the intestines of fish are thrown into a vessel and salted. Small fish, either the best smelt, or small mullet, or sprats, or wolffish, or whatever is deemed to be small, are all salted together and, shaken frequently, are fermented in the sun. 2. After it has been reduced in the heat, garum is obtained from it in this way: a large, strong basket is placed into the vessel of the aforementioned fish, and the garum streams into the basket. In this way the so-called liquamen is strained through the basket when it is taken up. The remaining refuse is alex. 3. The Bithynians prepare it in this manner: It is best if you take small or large sprats, but if not, wolffish, or horse-mackerel, or mackerel, or even alica, and a mixture of all, and throw these into a baker's kneading trough, in which the are accustomed to knead meal. Tossing into the modius of fish two Italian sextarii of salt, mix up thoroughly in order to strengthen it with salt. After leaving it alone for one night throw it into a vessel and place it without a lid in the sun for two or three months, agitating it with a shaft at intervals. Next take it, cover it, and store it away. 5. Next, if you wish to use the garum immediately, that is to say not ferment it in the sun, but to boil it, you do it this way. 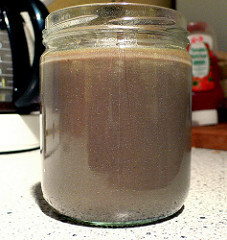 When the brine has been tested, so that an egg having been thrown in floats (if it sinks, it is not sufficiently salt), and throwing the fish into the brine in a newly-made earthenware pot and adding in some oregano, you place it on a sufficient fire until it is boiled, that is until it begins to reduce a little. Some throw in boiled-down must. Next, throwing the cooled liquid into a filter you toss it a second, and a third time through the filter until it turns out clear. After having covered it, store it away. Note: This is a very smelly process which was performed outside towns, near rivers and salt deposits.